—That there is peace with God through Jesus Christ, who is Lord of all. Mark and Patti Bean finished the translation project of the Margos New Testament. I had the privilege of attending the dedication. So what do Bible translators do after they finish the New Testament? Mark and Patti launched into a very ambitious project. Mark is facilitating the simultaneous translation of the Old Testament into six related Quechua languages. With 15 or more men gathered around their computer screens, each team is able to work on their translation of the verses for the day. Because the Huallaga Quechua Old Testament Translation is nearing completion and the grammar has been analyzed for each of the target languages, Mark can use the CARLA (Computer Assisted Related Language Adaptation) program to generate a rough draft in a matter of minutes for each of the teams. He then sends the files by a wireless network to each of their computers for them to work over. At the same time, they can check the quality of the Huallaga translation and fix any problems they discover in that translation. The advantage of doing the translation in workshops is that each team can review and compare their translation with that produced by the other teams. In this way they can take advantage of creative solutions to challenging verses. The goal is to complete 39 verses each day to stay on schedule for completing 40% of the OT within the next five years (if they can fit in four or five workshops of two-to-three weeks each year.) This is a huge commitment for men who come from far away villages. They must leave their fields and families for weeks at a time. And when they come home there is much work to do to check the chapters they translated to make sure the translation is clear and accurate. So far they are on schedule to complete through Genesis chapter 49 by next week! Pray that this project advances with great success. With only a couple days to spare, the airmail packages arrived at our office with the first few dozen copies, the first fruits of years of labor revising and reprinting the Kashinawa New Testament. A few weeks later the Montags returned with glowing reports of how excited the people were to receive their New Testaments. It had been out of print and unavailable for several years. Now we are working on the paperwork to import the rest of the shipment for both the Kashinawa and the Cajamarca Quechua New Testaments. The Cajamarca NT dedication is planned for January. Pray that the shipment arrives from Korea where it was printed, in good time and undamaged. Jaime and Robert help us in the media department with their expertise in digital editing. The next big project is to convert over a dozen Luke and Genesis Videos from the master digital tapes and make DVD versions of these productions. In this way we will be able to easily and inexpensively copy and distribute Luke and Genesis on DVD. They are also working on a CD project, putting the entire South Conchucos Quechua New Testament sound track in a chapter-by-chapter format. This will be an audio set of about 12 CD’s. A local Quechua radio station wants to use this in their daily programming. Thanks for your support in our work and these kinds of projects. Laura had a wonderful trip to the US for three months, staying in our home in South Carolina and living with Ondrej and Loris. She enjoyed her independence as she went to work each day as the receptionist at the JAARS maintenance office. Now it’s back to work—school work—after a belated birthday party. Laura had all kinds of friends waiting to greet her here, reminding her they missed her. We are so thankful for the good friendships Laura and Jonathan have made in their adjustment to living in Lima. Jonathan and I took a trip out to the Yarina Center to help clear out the last few buildings. Our Yarina Center has been the main base of operations for over 45 language programs, most of which now have a New Testament translation. But with few remaining programs, the huge center was far too expensive to manage. It has been turned over to the Ministry of Education for them to develop a university primarily focused on higher education for indigenous peoples from the Amazon region. 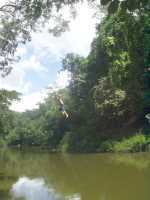 Jonathan and his friend, Andrew, built the last rope swing out over the water. They even talked me into giving it a try. What a rush! Each Saturday Sally and I lead the high school youth program along with Rick and Melanie Floyd. We have had a great turn out with 16-20 youth crowding our living room. It is a lot of fun and a great opportunity to shape the lives of these young people for Christ during this crucial formative time of their lives. Sunday is also filled with ministry as I lead the worship team at church on Sunday mornings, and Sally leads the worship at our center evening meetings. Thank for your prayers as we serve the Lord in these ministries.